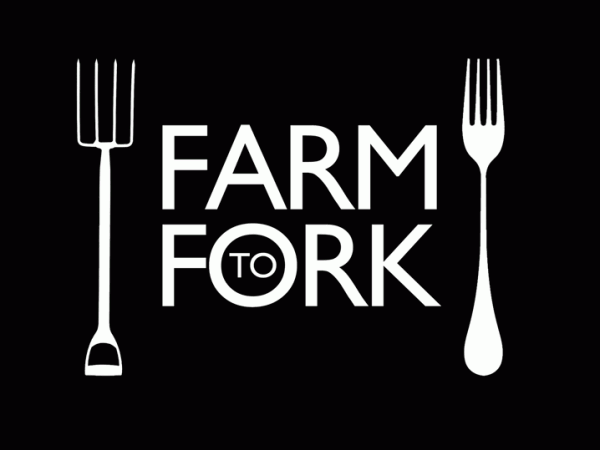 Farm to Fork is about knowing where your food comes from, how it’s grown and raised and reducing the chain from farm to table. Blog readers will know we are passionate about local produce and we are working with The Angel Inn at Stoke by Nayland to supply beef and pork for their kitchens. Farm to Fork came about when Head Chef Mark Allen asked if we would supply beef to The Angel. Mark had heard about our Nayland Beef from a chef friend in a London hotel in Mayfair. Mark was keen to take his sourcing a step further and support local, small-scale and artisan producers by buying direct to bring the best local ingredients onto the menu. So we got to talking and I suggested embracing all stages by getting involved and rearing pigs at Lower Dairy Farm exclusively for the Angel kitchens. And here they are! Our three large black piglets surveying the mammoth task ahead; a jungle to explore, snuffle and munch their way through complete with hazelnuts, acorns and burdock roots to excavate - piggy bliss! We want people to follow the story from pig to plate and engage in how their food is grown and raised. So step away from the supermarket shelves and get down to your local farm shop and whilst you're at it, pop into your local for a drink and a Lower Dairy Farm steak! Mark is a genius in the kitchen and we can't wait to see what he will produce from our tasty Horkesley Porkers. Choose a casserole dish or container in which the beef fits snugly. Mix together the sugar and sea salt. Rub this mixture over the beef and place the joint in your chosen dish. Cover and put in the fridge, or a very cool place such as a garage [clearly these people don't have a curious terrier called Humbug!] for 2 days. After two days, roughly crush the peppercorns and berries in a pestle and mortar. Rub this spice mix all over the beef and return to the dish. Cover and chill. Heat the oven to 140oC (120oC fan oven), gas mark 1. Remove the beef from the dish and discard the juices. Quickly rinse away any spices and put in a casserole dish again, just large enough to hold the beef snugly. Add 300ml water, bring to the boil and cover with a tight-fitting lid. Cook in the oven for 50 minutes per 500g. Remove from the oven and leave in the dish to cool for three hours. Drain the beef and wrap it in clingfilm. Put in a lipped dish in the fridge and press down with weights overnight. To serve, slice thinly (even I can achieve deli counter slices!) and enjoy your very own deli-cured beef in sandwiches! This week, across the country, people have celebrated the quality, versatility and nutritional powerhouse that is British Beef! Not really! But this is a screen print by the brilliant Paul Bommer (click here for more info), hanging on our kitchen wall...and the resemblance is uncanny! Happy British Beef Week from the Lower Dairy Farm Herd! Watch out Mr Heinz! Hannah has outdone herself this year, taking advantage of seasonal and locally sourced produce to create 37 varieties of chutneys, pickles, jams, jellies and preserves. Perfect (and colourful) Christmas presents! Particular favourites this year: Elderflower Rob - a non-alcoholic hedgerow Creme de sureau, perfect with champagne, and Rosehip Syrup - for coughs, colds, general deliciousness and particularly good poured over ice-cream! Making last-minute present shopping a breeze! The calm before the storm on the farm at the moment. Mum and Dad are busy fixing, winter-proofing, feeding, cleaning, littering and keeping the animals in the luxury to which they have become accustomed. We await the calving of Caramel (why is there never a full moon when you need one), so watch out for a sleep-weary Farmer Humph if you're driving up Water Lane in the dark. And we're on tenterhooks as the wait for the sugar beet harvester goes on. Rumour has it, the beast may head our way soon...and then you'll never have met a yokel (me) so happy to be hand-scraping sugar beet mud off a road...as it will be for the last time. Over in the shop, it's time for Shop Local Saturday on December 7th! Part of a campaign to encourage folks to support local traders, look out for signs across the nation, and show your support for independents of all shapes and sizes. It may be autumn outside, but when the need for a mince pie (or two) hits, Hannah's delicious mincemeat is waiting for you in the farm shop. We're reaching the end of a calving bonanza!...A blissful, unattended calving patch which has caused Dad undue worry as another calf appears in the field, but as they were all planned, we say bravo to easy calving. British Food Fortnight has gone back to it's roots and is celebrating Bringing Home the Harvest, so we're joining in with a long awaited Harvest 2013 Round-up! And this year, you get to see the Mighty Mercator in action. ..and the Mercator glid gracefully into the fields like it wasn't a day over 30. That is, after the damage caused by LDF's bionic mice - who eat and line their nests with copper wire, was sorted out. Well'ard mice. This year we were able to take advantage of the perfectly timed spells of fine weather to complete the harvest in record time relative to the past few years. Despite being short on horsepower, all was gathered in safely and Hallelujah! Praise the Heavens!, the bales were beautifully stacked in a high heap to avoid the horizontal formation of last year...and the year before. S ometimes, I like to think He listens to us. With the Mercator tucked safely into bed, we were on to bale hauling, multiple calvings (more about those soon), with Dad subsoiling, hedge cutting and prepping everything to start all over again! Plus, the start of the Christmas orders in the farm shop! But best of all...the milkstand is back! Enjoyed by the lake with the Wormingford Community Education Centre volunteers. Thanks to the Stamps for the invitation and delicious fare!